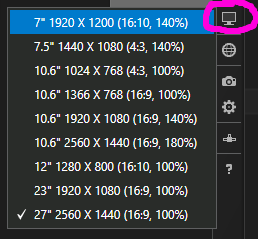 Once you’ve decided if you’re going to stick with the default minimum 500px width or not, run your app and just see how it behaves at arbitrary widths in Windows 8.1. Pay attention to things that used to appear, disappear or change size with the old view state modes. Also test things such as settings flyouts still work correctly at the minimum window width. Make a note of any problems that need fixing. The next step is to decide what UI elements will change at different widths. Now whenever the window width changes, you’ll see the size updated in the in the TextBlock. Once you’ve worked out what UI elements need to change at what sizes, you can use code in the OnSizeChanged event handler to change the UI state when certain widths are detected. One possible way to deal with differing window widths is to define responsive breakpoints. These are those widths when the layout changes. Between each breakpoint size the app fluidly fills the available space. Here the view state switches between (S)mall, (M)edium, (L)arge, and extra large. The three consts are effectively the responsive breakpoints. I assume this breaks backwards compatibility with Windows 8.0?